Kenya Summer Moore is an American actress, model, author, and producer. She won the 1993 Miss Michigan USA and Miss USA 1993 titles and finished in the top six of the Miss Universe 1993 pageant. Additionally, she founded the Kenya Moore Foundation, a charity which awards scholarships to underprivileged girls from her high school alma mater. Moore was born in Detroit, Michigan and was raised by her grandmother and aunt. She graduated from Cass Technical High School and attended Wayne State University, where she majored in psychology. Moore successfully leveraged her pageant wins into appearances in several television programs including: Video Soul, The Fresh Prince of Bel-Air, Martin, Homeboys in Outer Space, Sparks, Smart Guy, Living Single, Damon, The Steve Harvey Show, In the House, The Jamie Foxx Show, The Parent 'Hood, Nubian Goddess, Men, Women & Dogs, The Parkers, Girlfriends, Under One Roof, and Meet The Browns She has also appeared on the covers of Glamour, Seventeen, Ebony, and Essence magazines and can be seen in the music videos for Jermaine Dupri's "Money Ain't a Thang" (1998), Shai's "I Don't Wanna Be Alone" (1996), and Nas' "Street Dreams" (1996). Additionally, Moore has appeared in several films: Waiting to Exhale (1995), Trois (2000), Deliver Us from Eva (2003), Brothers in Arms (2005), I Know Who Killed Me (2007), and Trapped: Haitian Nights (2010). In 2012, Moore joined the season five cast of The Real Housewives of Atlanta. 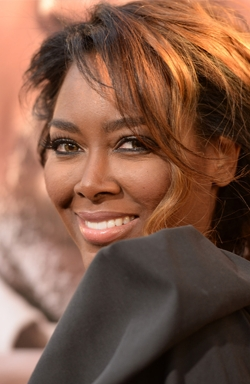 In 2013, she released a workout DVD titled Kenya Moore: Booty Boot Camp. Moore was credited as producer/director of the film Haitian Nights; after the project lost its director for unspecified reasons, Moore took over the production and completed the film. When the film failed to find distribution, Moore founded Moore Vision Media, an independent movie production and home-video distribution company. The company's first production was The Confidant, released by Universal Vivendi on August 24, 2010. 1995 Où sont les hommes?